A driveway gate is a great addition to any property, providing both an aesthetically pleasing street view, and added security and privacy. 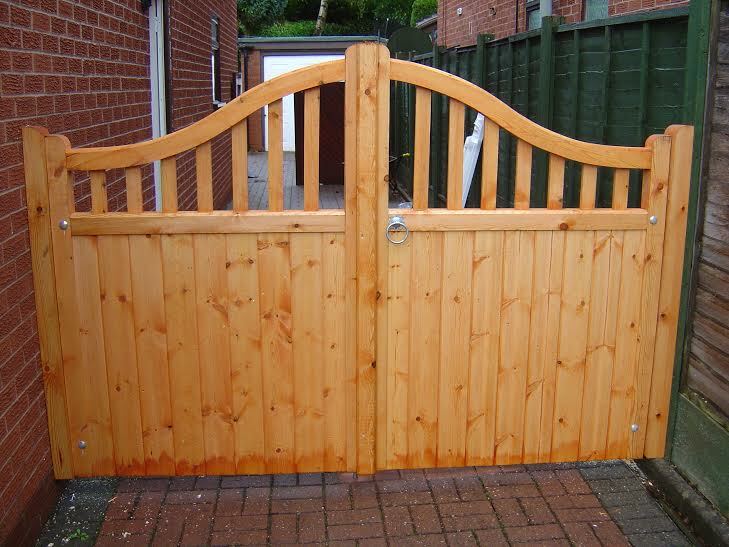 Here at B&K Timber we specialise in providing bespoke, wooden driveway gates in Birmingham and the rest of the UK. We produce driveway gates to suit all tastes and property styles, from eye catching options like the Brereton driveway gate, through to the classic Sherwood shape. High Quality Driveway Gates in Birmingham from B&K Timber! Our driveway gates are available to purchase online, and are then made bespoke to your requirements. You can take your time browsing through our different styles and then use our measuring guide to accurately measure the gate area –this ensures a snug fit! Don’t worry if you get stuck, we’re a family run business and are on hand to help you through the process, just give us a call. Once you’ve placed your order with us our team will then create your bespoke driveway gate using high quality, Scandinavian slow grown, joinery graded redwood timber. Gates are available with the choice of three spirit based preservatives to give you a choice of colour – brown, red cedar and clear. Delivery of our driveway gates in Birmingham is free, and we employ all of our own drivers to ensure that your driveway gates are delivered in perfect condition. At B&K Timber we combine our expertise with stunning gates to provide an unbeatable service. You can take a look at our driveway gates gallery to see some examples of our exceptional work throughout the country including hardwood gates in Cheshire and Staffordshire. If you would like to find out more about our driveway gates available in Birmingham, then please take a look at our gate builder or get in touch a member of our team. Don't forget we also provide the best driveway gates in Stoke on Trent, the rest of Staffordshire as well as Cheshire and Manchester too!